I’m starting on an extended road trip in September. I don’t know how long I will be gone; at least a few weeks. The closest I’ve come to a schedule is thinking that I should be back home by election day in November. I have been thrilled to discover and use Airbnb.com, a unique site. It puts travellers in touch with people wanting to rent houses, rooms – I even saw someone renting a couch for $10 a night. There are also very expensive rentals. The prices range from very low to very high; something to meet anyone’s budget. I stumbled across Airbnb after checking out typical, chain hotels in Medora, South Dakota next to Theodore Roosevelt National Park, the sort of hotels easily found using sites like Expedia. They were all too expensive at around $200 a night. The great thing about Airbnb is that one’s accommodations become part of the travel experience. One can stay in unique dwellings, truly one of a kind. I’ve booked into two places, each for three nights and each at about $90. 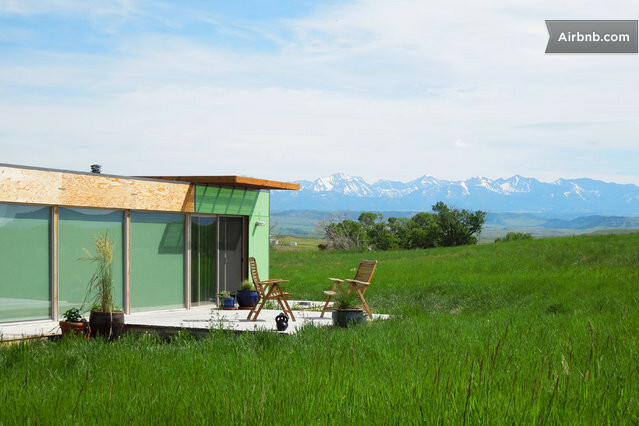 Here is one of them, The Shipping Container Home in Montana.